Q & A: Why make climate change art? Q&A: Why make climate change art? Louise Ridley, an arts journalist and journalism student from Goldsmiths College in London, England, recently contacted me about a paper she was writing on climate change art. She had seen my Six Tools for Climate Change presentation from October 2007 and was wondering if I’d done any more work in that area… I was happy to tell her that her timing was amazing — in that I had just returned from speaking at the University of Cincinnati where I gave a lecture and two climate change art workshops on the theme, What’s bothering your green conscience? Below is Louise’s Q&A email interview with me. LR@Goldsmiths: How did you end up doing the work you do, was it because of the artistic or environmental side of you, or both? Franke James: I’ve been an artist all of my life — the question for me is always “How do I get the idea out of my head and into a tangible form so that other people can see what I’m seeing? Should I draw, write or take a photo?” Sometimes I do all three — as you can see from my visual essays online, or in my book, Bothered By My Green Conscience. 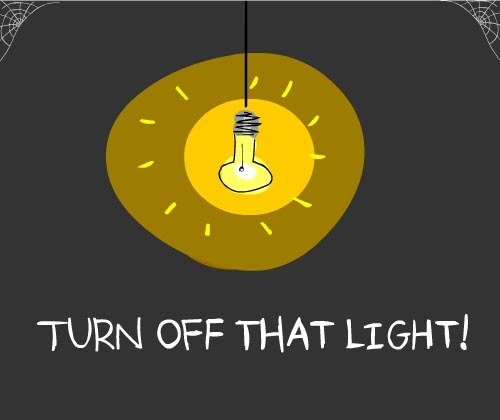 The light bulb came on for me in 2005. We were doing an energy audit on our house and discovered that it was an energy sieve. This really shocked us (our score was appalling) and motivated us to take action by insulating our house, installing double and triple pane windows, etc. But the spin-off benefit (aside from having a better insulated house) was that I started to read about energy efficiency and climate change — and grew increasingly concerned that we weren’t doing enough. 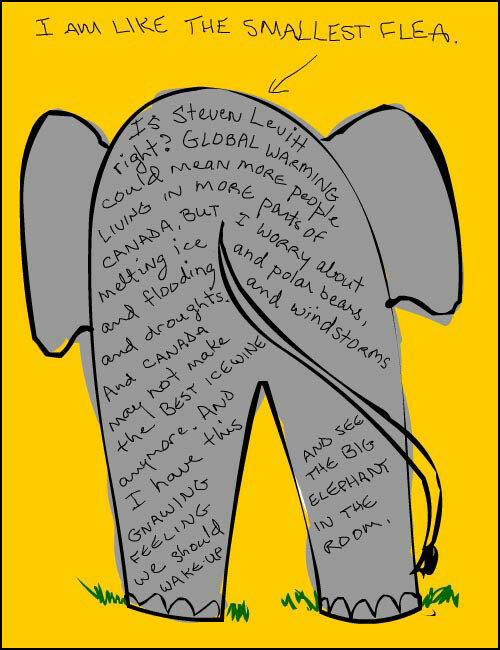 Climate change is the big elephant in the 21st century room that no one wants to talk about. And yet, it is going to radically change our lives and shape this century. It is both a crisis and an opportunity. When I first started working on climate change in 2006, I wrote some very, very long blog posts. I spent months researching them and interviewing people. My first article was 5,644 words! It’s not surprising that I got very little response. Most people don’t want to read long articles. I realized that my approach wasn’t working. I thought — people aren’t paying attention. I need to communicate my concern more powerfully and more directly. That’s when I decided I would start telling personal stories about climate change and the actions I was taking. I decided to do something that was a big statement (selling our SUV) that I would feel was making a difference. 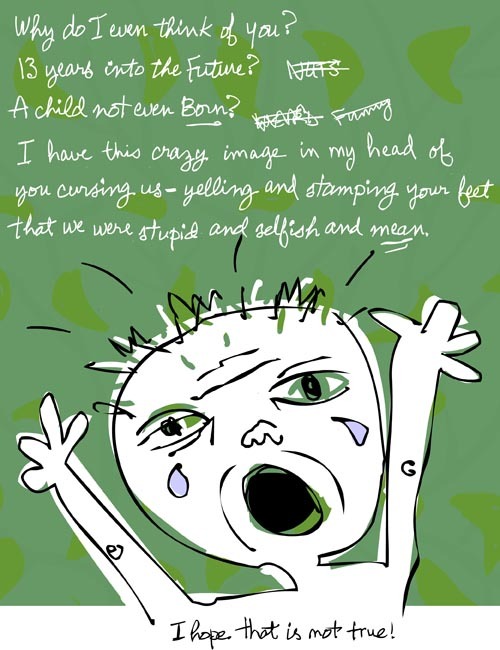 I told my story simply using words and pictures. That’s when I started connecting with people. 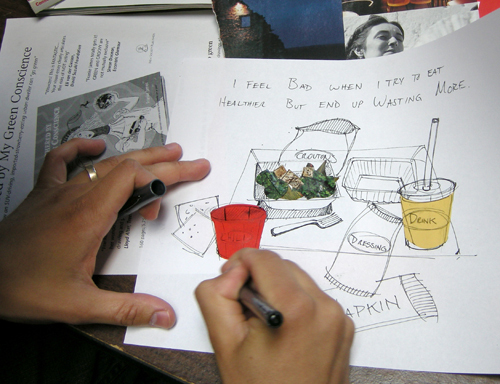 LR@Goldsmiths: Do you see your work as reflecting what is happening? Or trying to rouse people into action? Lindsay feels powerless in some ways (Kyoto, garbage) but then states how she feels encouraged by my essay — that little things she does can make a difference. She agrees with a point I make — which is that the next generation will be cursing us if we don’t take action now. Through my artwork, I hope to inspire people to take concrete action. LR@Goldsmiths: I’ve seen your visual essays, which are quite an unusual type of art, is there a reason why you choose this way to express yourself? Franke James: (Laughing. Quite an unusual type of art??) I’m using every tool in my toolbox and loving it. I have total freedom in my work to do whatever I want. I’m happy with my style. 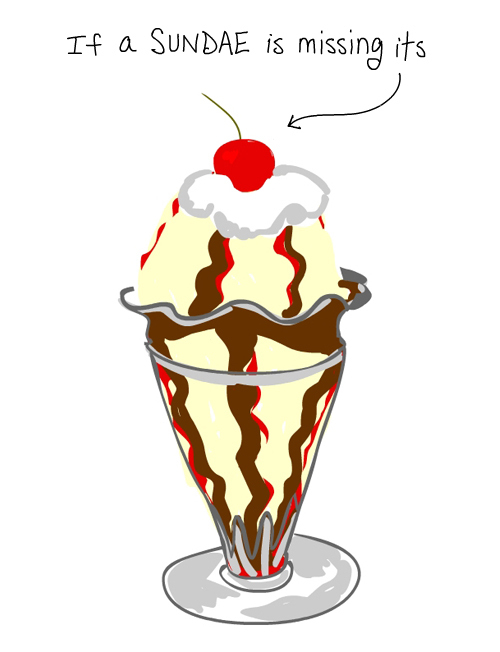 I have a lot of fun — I get to put a bright red cherry on the top if that’s what I think is best. The technique is less important than the message. It could be stick figures — the important thing is: What are you trying to say? I encourage others to develop their own personal style that is right for them. LR@Goldsmiths: How and why did you come up with your Six Tools? LR@Goldsmiths: As well as an artist you are also an educator, how do these two roles work together? Franke James: I may educate people through my work but that’s not my occupation. I am not a teacher. I am an artist, writer, photographer, game designer and communicator. In much of my work I try to raise awareness, change behaviors — and ideally inspire people to take action. Franke James: Yes! 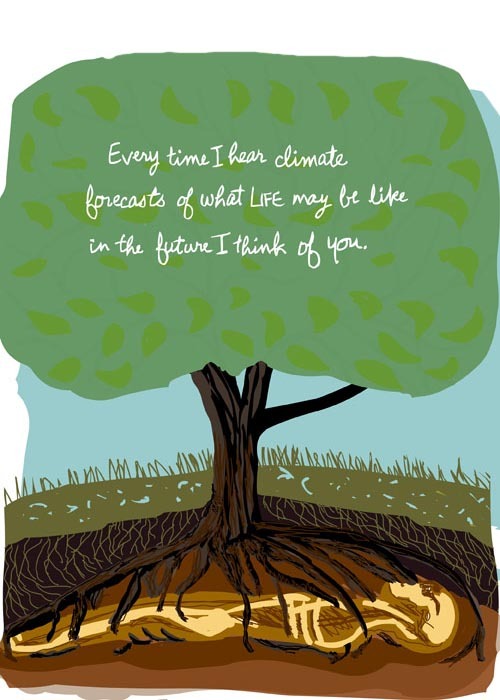 Anyone can make climate change art. People are concerned about climate change. But how do they express that anxiety? Many of us feel overwhelmed and powerless. By taking action we regain our power. 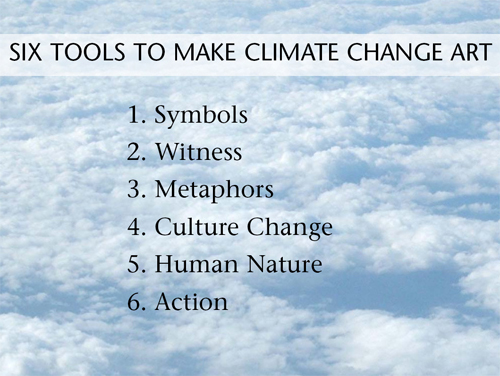 In my six tools, listed below, I think #6. “ACTION: Do something green and record it.” — is THE most powerful and transformative tool. You don’t need to be an artist to do something green and record it. doesn’t necessarily mean make visual art. It can be in any medium. Performance art, poetry, dance, music, blogs, newspapers, flyers, etc. 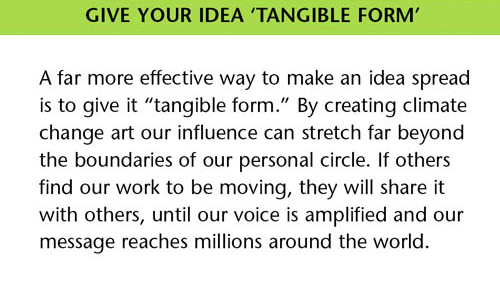 The important idea is to do something green — and then tell other people what you did via whatever communication media fits you. That is proving very effective in getting the average person (who doesn’t see themselves as an artist or very green) to express their concerns about climate change. See my recent post from doing two workshops in Cincinnati. Many people don’t think they are “green.” And yet if you ask them “What’s bothering your green conscience?” they will come up with several ways their conscience nags at them to remind them to put something in the recycling rather than the trash. And even if they do slip up and put it in the trash — their conscience is still there, reminding them the next time. LR@Goldsmiths: What kind of response do students have when you teach them? 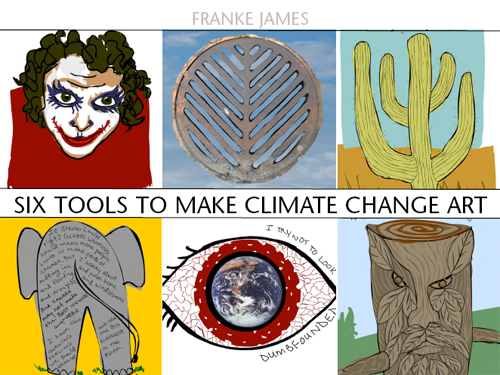 Franke James: So far — a terrific response! 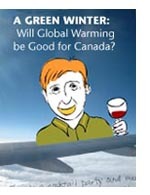 Asking people what is bothering their green conscience is not a question they get asked everyday. It can bring out some really surprising and novel ideas. Creating their own green conscience collages gives them an opportunity to express their ideas about climate change and the environment. Below is an example of artwork and feedback from a UC workshop participant (who is a product designer and obviously a natural talent at drawing). And here is really neat feedback from a mother who saw my presentation in 2007 at the McMichael — I find her response exciting (and gratifying) because it points to the power of using visual art to express and persuade — which is the whole point of what I’m doing. It’s about getting the ideas out of our heads and into a form that others can see. Where can this lead? I wonder if this girl has found a new way to express her ideas? LR@Goldsmiths: Climate Change has, certainly in the UK, risen up the news agenda and become a much more widely recognized issue than it was, say, five years ago – is the situation the same in Canada? 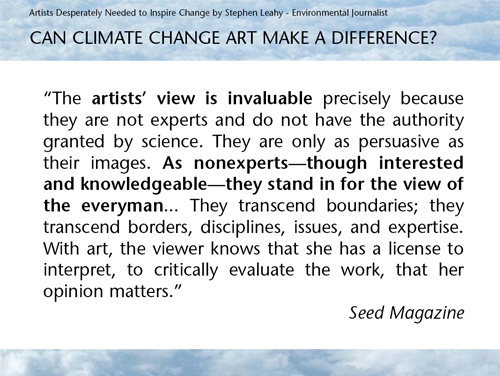 If it is, do you think there are still people who need to be made aware of the issue, or does art have a different role now that most people are aware of climate change? Franke James: Remarkably there are still people in Canada hiding their heads in the Tar Sands over climate change. I don’t think we can change the minds of the people who are confirmed climate change deniers. Better to try to persuade the people who are on the fence — or know it to be true, but feel powerless — to take action. I think artists can speak to people on an emotional and intellectual level. We can help people to shift perspectives. To see things in new ways. Unlike the scientist, we artists have the freedom to weave facts, opinions, thoughts, emotion and color all together. We can instill passion and motivate change. That is our palette. I believe it now more than ever. We just have to look at how things spread virally via the web, blogs, twitter, newspapers, radio etc to know that we can have an impact. LR@Goldsmiths: Is it possible to measure the effects of art on people with regards to climate change? 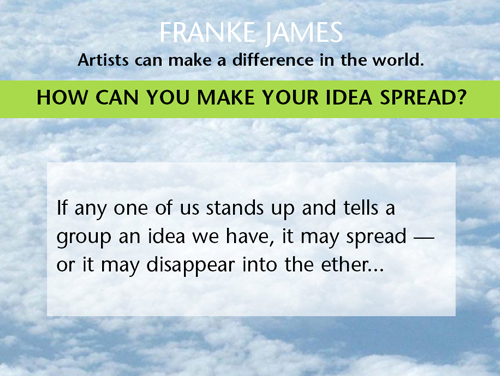 Franke James: I think that’s hard to quantify at a societal level. On a personal level, I can measure the impact of my work through the comments, emails, invitations to speak etc. By those measures I can see I am making a difference in many people’s lives. LR@Goldsmiths: Do you have much contact with scientists about climate change? Can you work together? Franke James: Collaborating with people in the science community is great — I love it! I welcome new opportunities. If you look at my past essays, for example, Dear Prime Minister, you’ll see I cited research by Pembina and Sierra Club among others. I learn so much from reading science research. It also helps me to put real benchmarks and measurements into my visual essays. So I can speak to people on an emotional level — and also an analytical level. For example, I turned to Joan Chadde and Dr. Alex Mayer from Michigan Technological University, to help me with the stormwater calculation for our green driveway (written about in Paradise Unpaved). It’s fun to see that there is a measurable difference in stormwater runoff between an interlocking brick driveway and a green driveway. 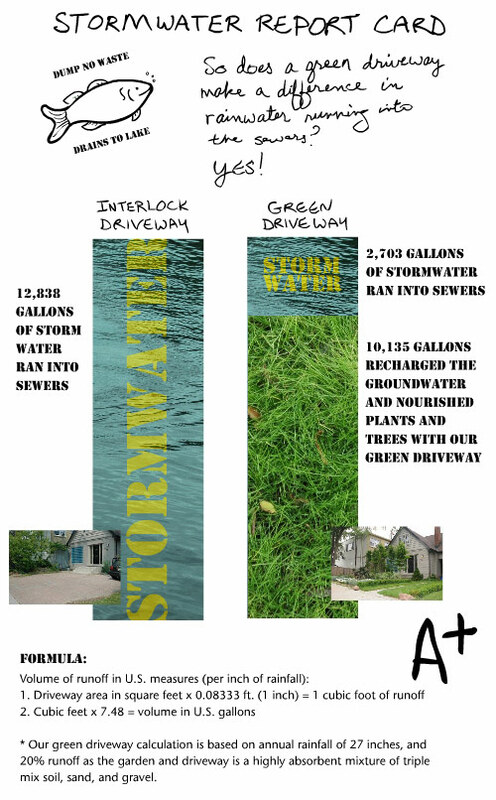 Saving 10,000 gallons of stormwater from going into the sewers can then be seen as having environmental and economic value. In my UC talk, How Alice in Wonderland thinking can win over City Hall, I cited the Insurance Bureau of Canada’s efforts to fight climate change. Why are they concerned? Because the violent storms we’re experiencing — which they openly attribute in a press release to climate change — are sending insurance claims through the roof. One storm in Toronto in August 2005 resulted in $400 million in claims! These are statistics that we can use to illustrate the climate change challenge we face. Thanks very much for this opportunity to share my work with you and some ideas on how climate change art can make a difference. I believe that artists can help people to see the writing on the wall.